Linking to other sites seems like an easy enough task, but it's one you should approach carefully. This is because improper linking techniques can hinder your link building efforts, which can negatively impact Search Engine Optimization (SEO) – and as a result, your site's authority. Fortunately, you can improve your site's credibility and brand authority by avoiding and/or fixing a few of these mistakes. Even more importantly, with your newfound knowledge you can prevent them from being made in the future. In this post, we’ll introduce you to link building and its importance. We’ll then highlight three of the most common (and detrimental) link building mistakes to avoid, and explain how you can do so, including with the help of tools such as Pretty Links. Let’s get started! In short, link building is simple: it's a process that enables you to gain links from other websites to your own, and it's something you'll participate in whether you know it or not. Improve your site’s search engine rankings: This makes it easier for others to find and link to your content, further improving your rankings. Establish you as an authority within your industry: Earning backlinks to your site from other reputable blogs will improve the value of your own content. Increase traffic to your site: This is great if you’re looking to improve your site’s readership, or increase conversions (including sales). However, keep in mind that the mistakes you make with regard to linking aren't just related to off-site content. 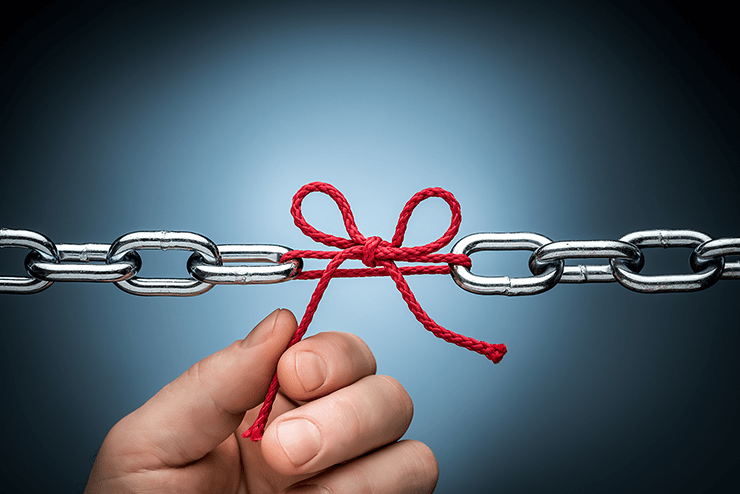 How you implement linking on your own website can have just as much of an impact, so it's important to get it right every time. While there are a number of link building mistakes you should take care to avoid, some are more detrimental than others. Let's take a look at three of them, starting with your anchor text. Neil Patel is always sure to optimize his anchor text to be descriptive and natural. As anchor text is an important element of your content, its poor use (such as repetitive use of the same link or unoptimized text) can be detrimental to link building. Both of these related mistakes can trigger a Google penalty, as Google may determine you are part of a linking scheme. This can be bad for your site’s SEO, and as a penalty may damage your brand’s reputation and can even undercut your credibility. Fortunately, you can avoid the poor use of anchor text and its corresponding links with the help of Pretty Links's threshold setting in conjunction with the Keyword Replacement feature. In simplest terms, this feature enables you to automatically link to pre-set keywords within your posts and pages, but it sets a limit on the number of links it includes per page. This means you can maximize and optimize the links you include within your content, which is good for both your readers’ experience and for your Google rankings. When you link to content with a low word count, you can also lower the quality of your own site. If you include outbound links within your content, Google references them when determining your website's quality. With poor-quality links, Google will not treat your content favorably. This means lower Search Engine Results Page (SERP) rankings, which in turn makes it more difficult for you to gain backlinks to your site. The best way to avoid this mistake is to know how to identify low-quality content. This includes pieces with a low word count (especially if other links on the topic are substantially longer), broken links, and duplicate content. As for what you should look for, there's plenty of available advice that will bear fruit. This will help you to easily hone in on higher-quality web pages, enabling you to link only to the best content. A Clicks report, as seen on Pretty Links, can help you gauge how your links are performing. Link tracking (that is, the number of click-throughs, the amount of shares, and more) is a helpful way to determine how your links are doing, both on your website and across the web. Of course, if you aren’t tracking your links, it’s impossible know how they're performing. This makes it difficult to improve them, and can also mean you’re wasting time and money in the wrong areas (especially when it comes to to paid ads and guest blogging). What's more, you can customize how the plugin tracks your links (and reports them to you) by changing the reporting style and excluding IP addresses (so they aren’t included in your report). Making mistakes when it comes to link building can have a significant impact on your website’s performance. However, avoiding the most detrimental mistakes, will mean you’re doing what you can to prevent Google penalties and boost your site’s overall search rankings. Repetitive use of an anchor text and links. Linking out to low-quality content. A failure to track your link's performance. Do you have any questions about link building on your website, or how Pretty Links can help? Let us know in the comments section below!